We just love a party. And, since we truly enjoy and appreciate every single one of your comments, we can’t help but have another contest to celebrate our 150th post today. One lucky, randomly chosen winner will receive a Morning Bray Farm 100% cotton Hanes tagless t-shirt. Since it’s a party, we’ll make it super easy for you. To enter our 150th post contest, simply leave a comment on this post. The contest will close Wednesday at 7 p.m. (Mountain time) and we’ll announce the winner on Thursday. Oh ME, ME! Pick me! I love the Morning Bray Farm brand with the ears in the ‘M’. Your blog is so enjoyable, and the pictures make me smile, even on a bad day! It makes for a good start to my day along with my first cup of coffee. I enjoy reading your blog each day. Your animals are awesome and so very well cared for and loved. Thank you for sharing your life at Morning Bray Farm. Hubby and i read you and 7 MSN every morning! !…first thing….!! Congratulations on the 150th post and all that. I came over here from 7MSN and enjoy reading about your crowd, too. I have a special spot for Ellsworth. I wonder if he ever thinks about what he left for what he has now? Doubt it, but who knows? This is such a lovely opportunity. 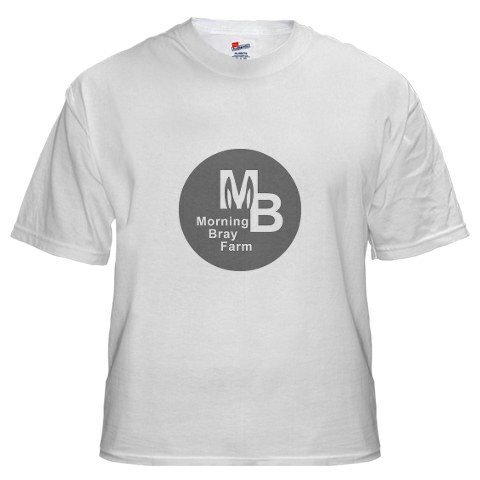 I would be proud to wear one of your t-shirts and then tell people about your boys when asked, “where is MB Farm?”. Cuz you know everyone would ask. Thanks for every one of your 150 posts. I always look forward to reading your blog. I love viewing your great pictures! I can’t have a donkey where I live because we have silly community rules. But I can enjoy the vicariously through you! I’ve read every one of your 150 posts. When you get ginormously blog famous, don’t forget me, okay? Your blog is one of my favorites. I just love your little herd of donkey’s. Is it called a herd if it’s donkey’s? Anyway, I would love to have a t-shirt. I just recently found your blog by way of 7MSN. I just can’t resist donkeys! They are so sweet and funny at the same time. I would wear your shirt proudly! Oooh, a party. Let me get my special hat on!!! I have been reading your blog ever since your first post and would love to have a T-shirt, too and the size Large. 🙂 Love you all burros; Bernard, Ellsworth, Fergus and Nigel! Ooooh, tagless no less. I’d love one. And I just LOVE your critters – I check in every morning, right after Carson. C in WI loves a party too! Thanks for all the smiles you bring to my mornings with your blog. Here’s wishing you another 150. Between you and Carson, you’ve definitely made a burro lover out of me as well! I am also a long time reader and would wear your brand with pride. So pick me, pick me!!! And par-tay! Congratulations on your 150th! I’ve slowed down considerably and lost count, myself. I love how cosy and affectionate your guys are with each other. That’s so beautiful to see. I love a party too!!! And cute little asses (hehehe)!!! 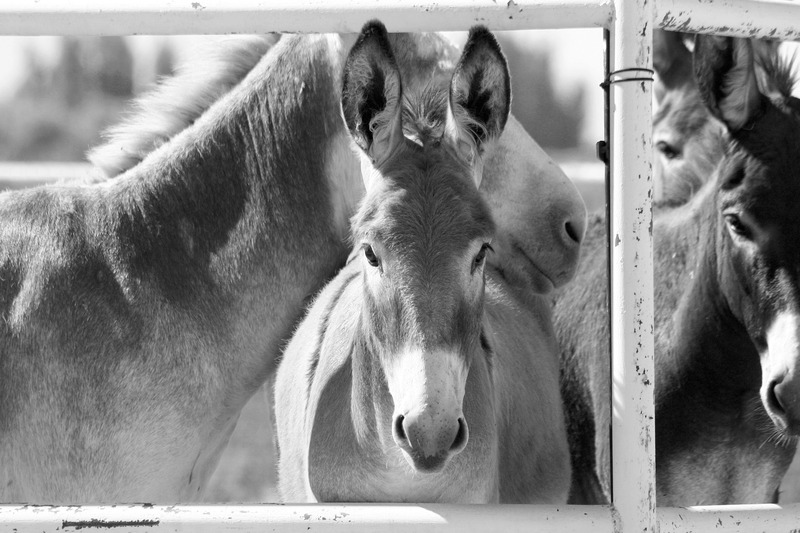 Love the pix of the burros and the commentaries. They bring a smile to my face. I enjoy reading your blog everyday. Congratulations on 150 posts. I’m so thankful you let me know about your blog. I look forward to it every morning. Give the boys scritches from Auntie Di. The shirt would go beautifully with my 7MSN hat. No burros allowed within city limits here. I get my burro fixes by reading about Fergus, Ellsworth, Bernard, Nigel and George and Alan. Congratulations on your 150th post! You make my day – along with my kitties and dog, your donkeys wake me up and make me smile! I love your farm and the care you provide for so many animals-dogs, sheep, goats and of course, the DONKEYS! I would be honored to wear a shirt and even more honored to gift one to my husband, who is very fond of you, your animals and cool t-shirts! No, Thank YOU for the Smiles … all 150 of them … so far. Don’t know how you find the time to post EVERY day, but so glad that you do. Can’t believe your Maw doesn’t have her own official Morning Bray T-shirt yet though. I think she needs to win this contest. Thank you for all the smiles that your boys bring to us! I enjoy your blog! and that is an awesome design on that tee!! I would be honored to wear a t-shirt celebrating your boys. Thanks for all the fun I have had reading about them and seeing the wonderful pictures. I like your logo. I hope you keep blogging for a long time; if I win can you put Nigel’s photo on the back? Thank YOU for all the smiles YOU bring to OUR faces ! I just love reading about your boys! They remind me how much I miss the Italian Donkey that lived at my friend’s grandmother’s barn. His name was Mafia. I enjoy so much reading your blog everyday. Congratulations on 150 posts. It’s a milestone! I start off every single day with your blog….I am getting to live vicariously since my DH has spent TOO much time overseas and will now never let me have my own BLM baby. Hey, we thought this was a party . . . where’s the chips and salsa? We brought some good ol’ Texas Shiner beer! I bet those burro boys ate all them chips . . . Happy 150th! Here’s wishing for 150 more! I’m a new reader and haven’t worked my way back through all of your posts yet, lol. I found you through 7MSN Ranch. Love all those soft-eyed donkey pics. If I am chosen as your Miss America…. If I win the t-shirt, I want a few herd hairs on it. Love you all so much…..every post is the highlight of my daily reading! I would love to have your tee shirt! Here I am. Am I the 47th caller? Seeing your boys brings back so many memories. We had a burro named Taco (I know, REAL original) who was out with our horses. I never worried about them when he was “on guard.” I just wished I could have trained him to read a calendar and know that he didn’t need to “go off” at 6:00 a.m. on weekends! pick me, pick me (hand waving frantically in the air)! THANK YOU and your beautiful critters for bringing all of us in blogville smiles every day!